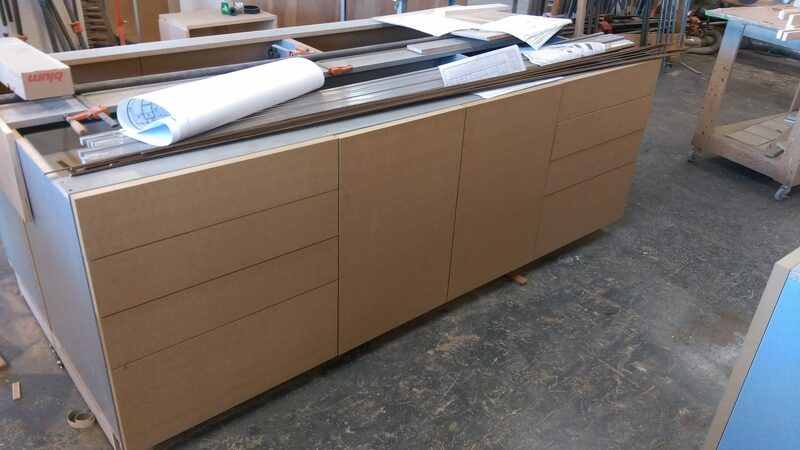 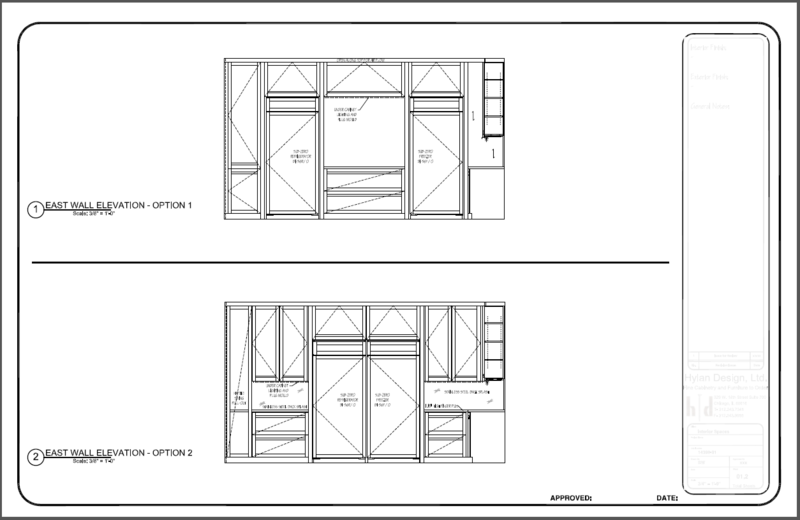 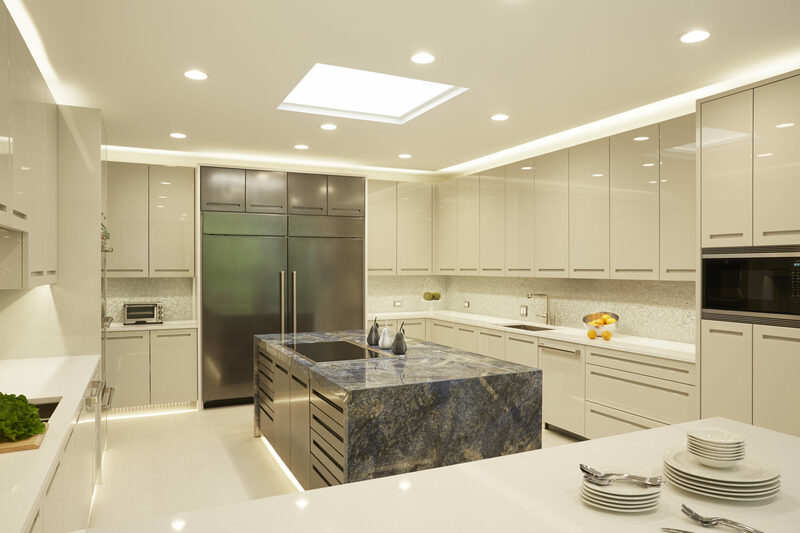 Hylan Design was brought in by one of our long time clients to design + built and be the general contractor for their new kitchen. 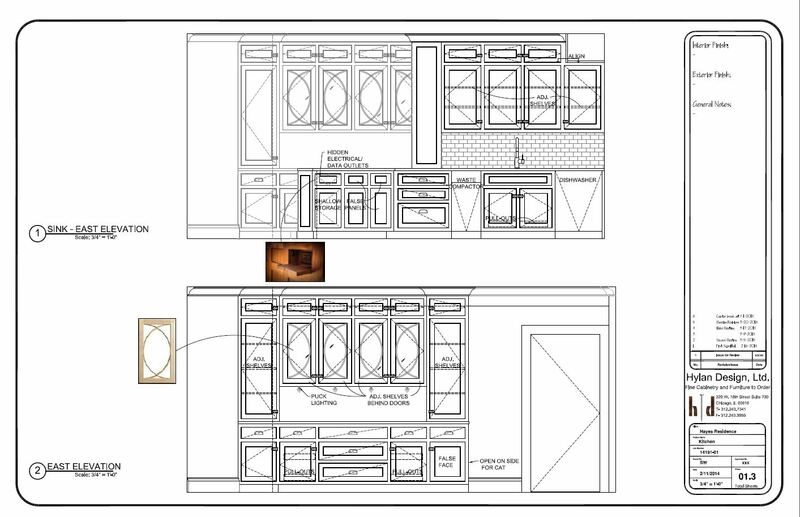 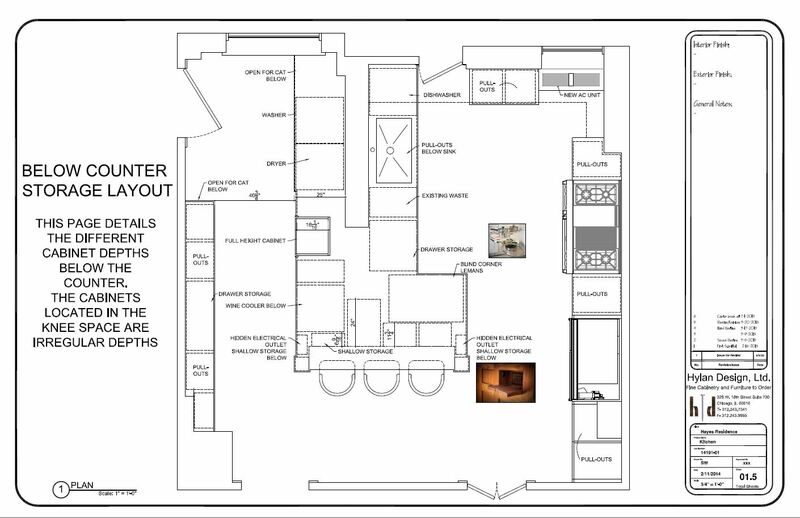 We passed concept images back and forth to find the perfect style then began different layouts and elevations to find the right design. 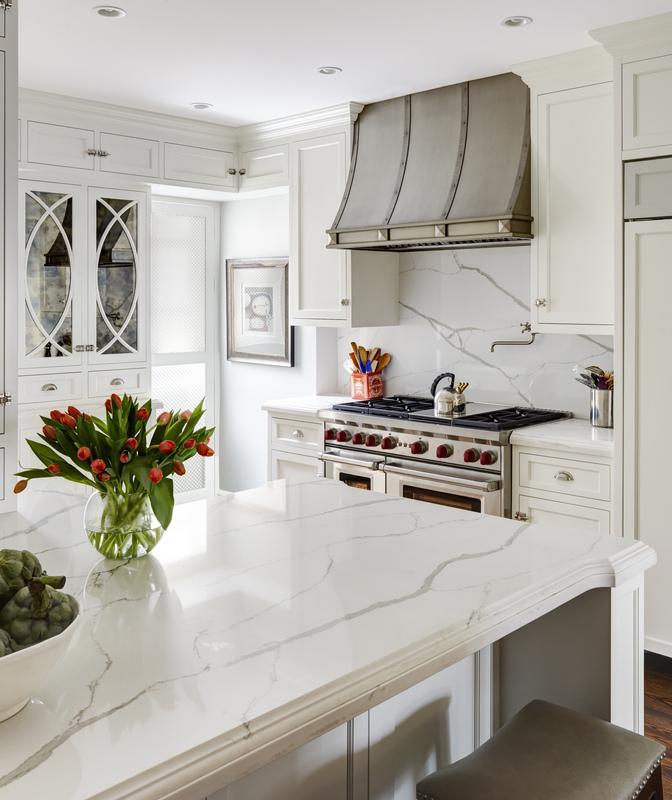 We landed on a painted white kitchen, with face frame construction and Calacatta Marble counter tops. 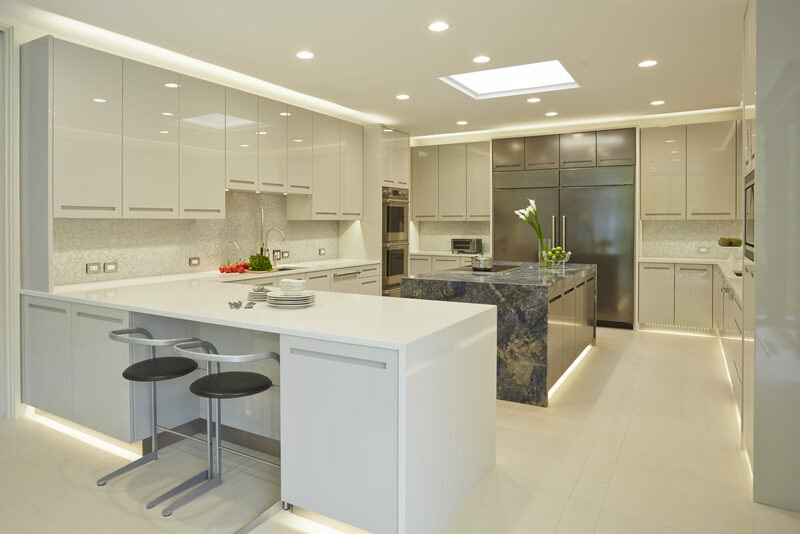 The finishing touches such as the bin pulls, ice box hinges, mirrored door and curved mullions made this kitchen a timeless design. 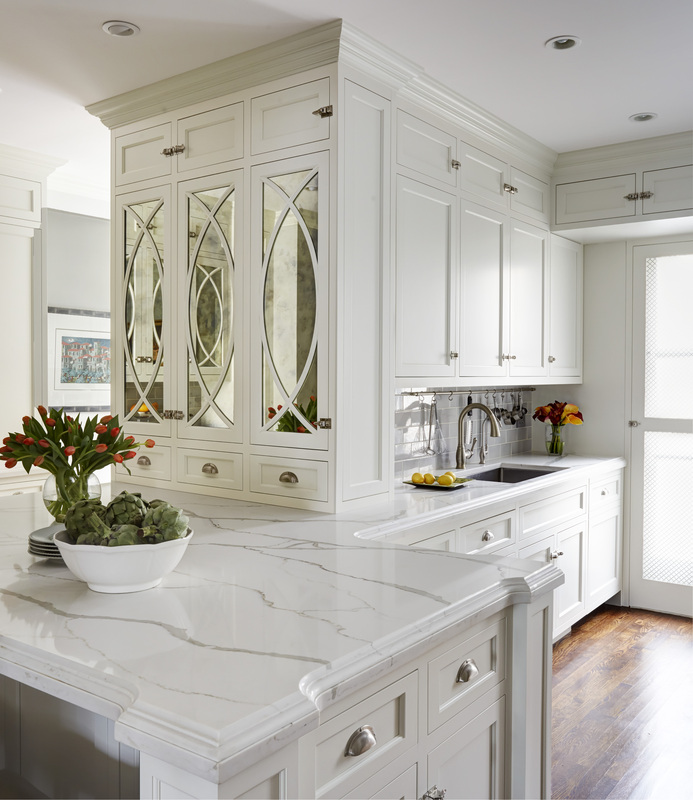 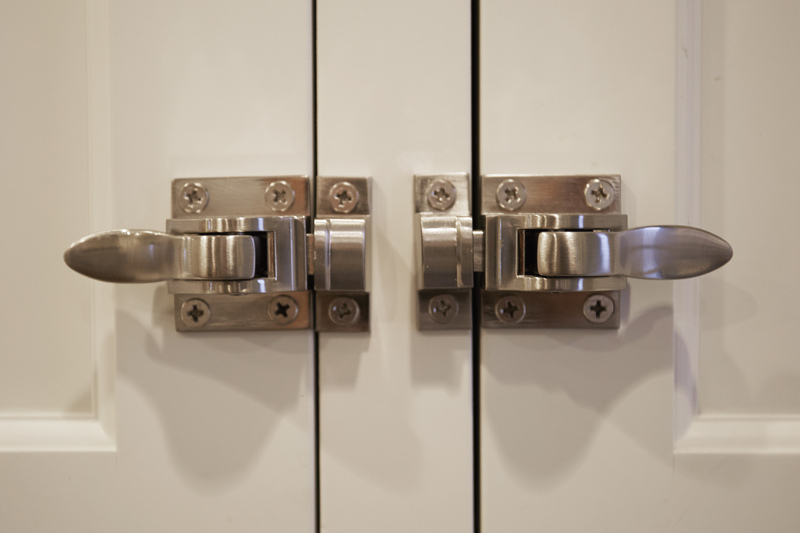 What was once an outdated space is now a bright and welcoming environment. 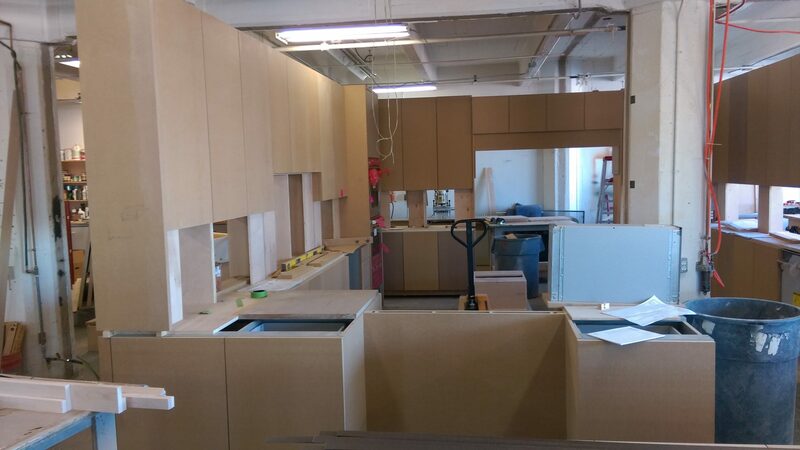 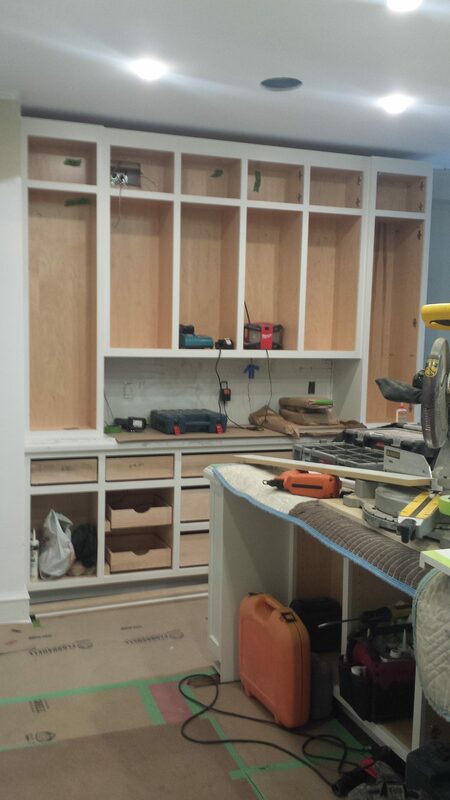 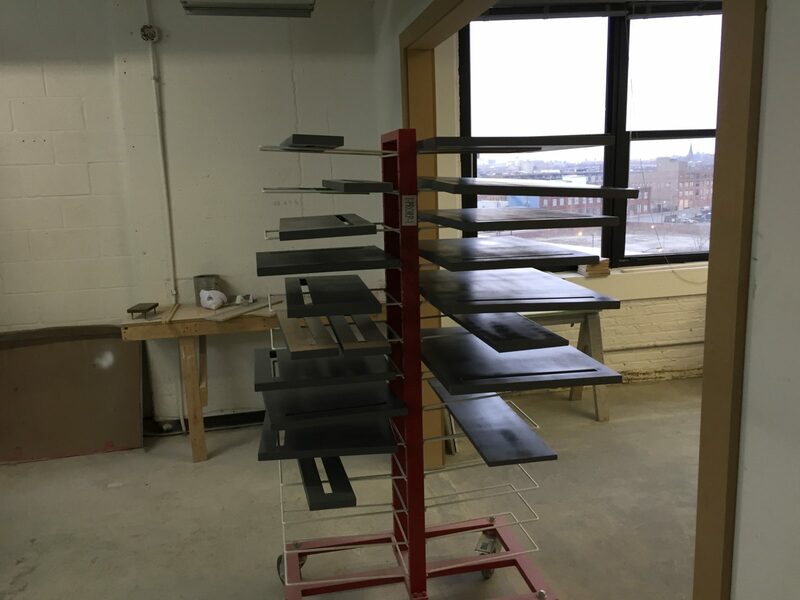 It may not look like it yet, but this is a chef's kitchen! 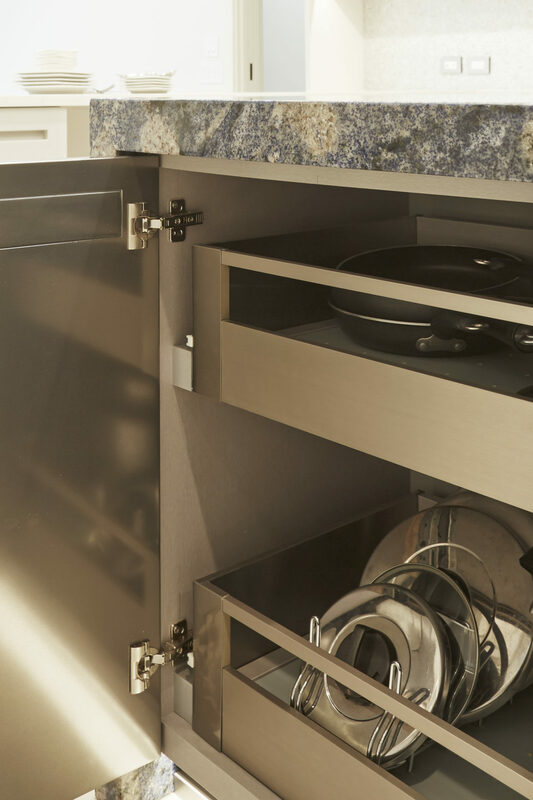 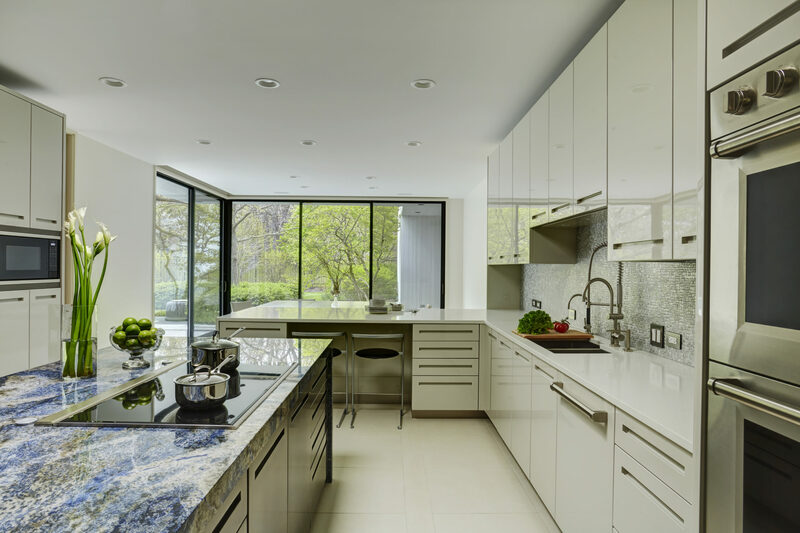 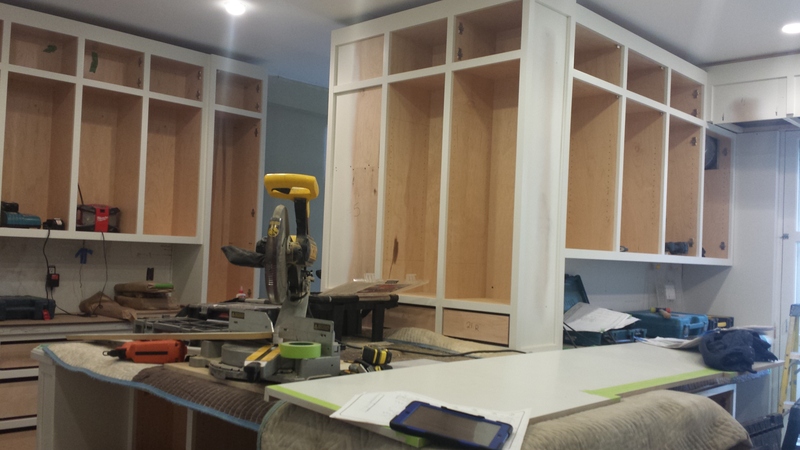 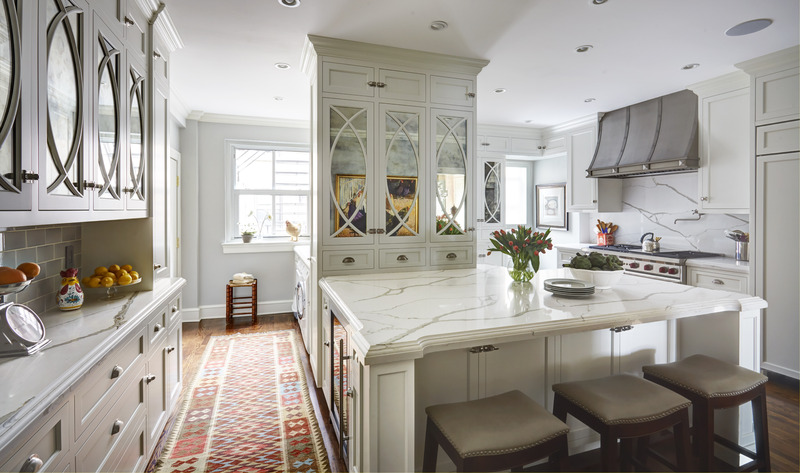 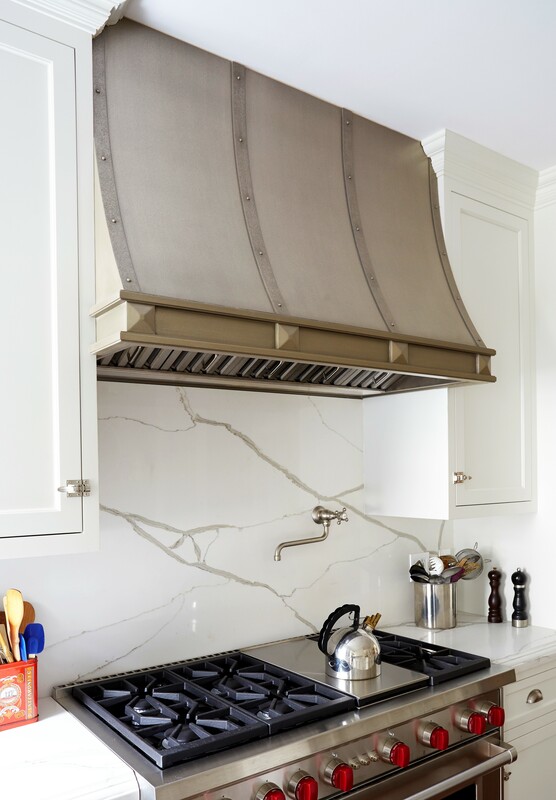 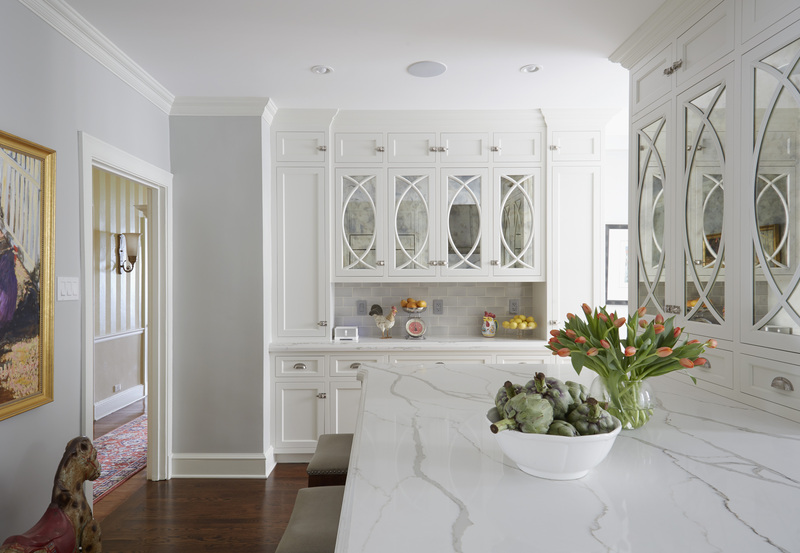 Hylan Design was brought in by Carrie Ratliff of Interior Spaces to engineer, fabricate, finish and install all new kitchen cabinetry, island and peninsula. 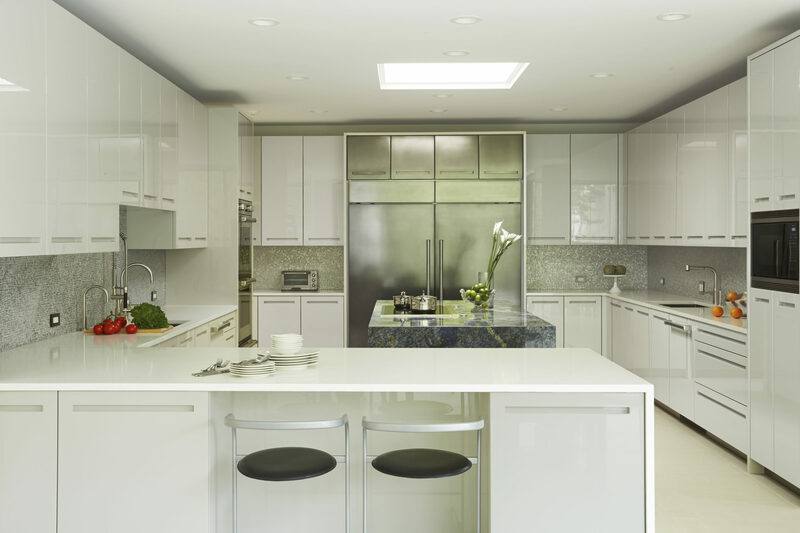 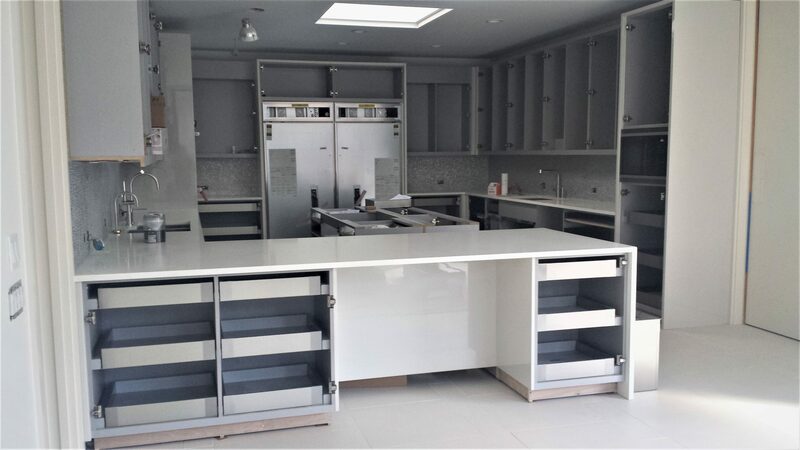 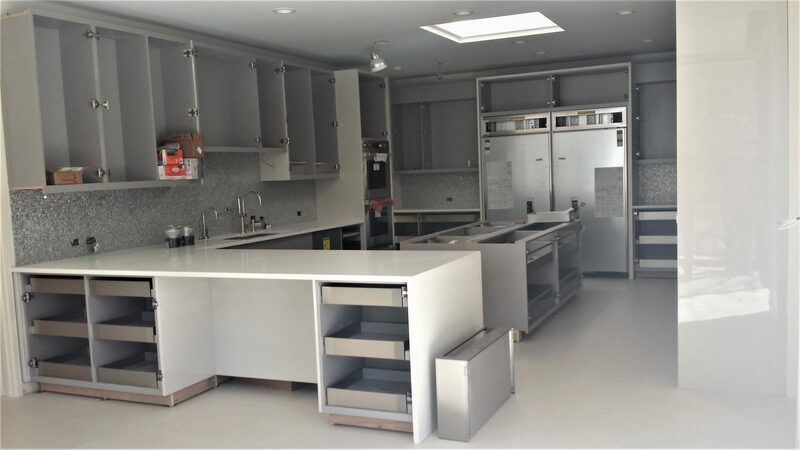 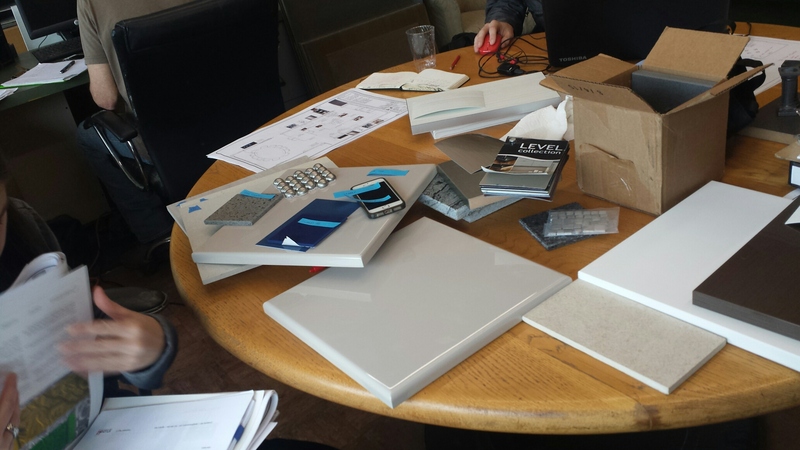 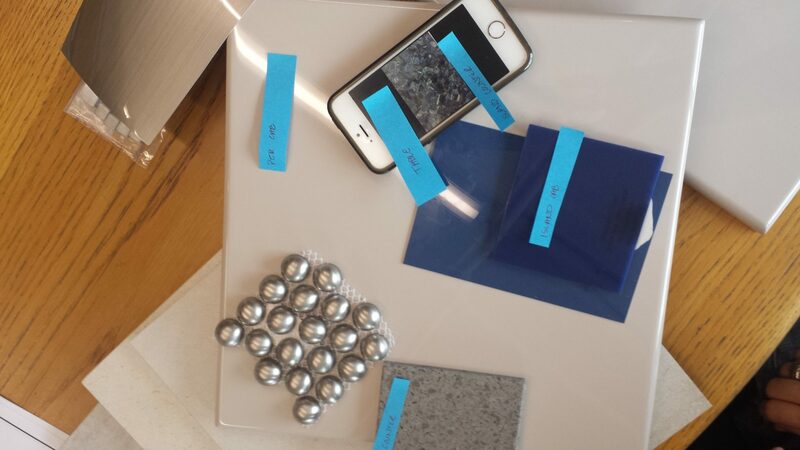 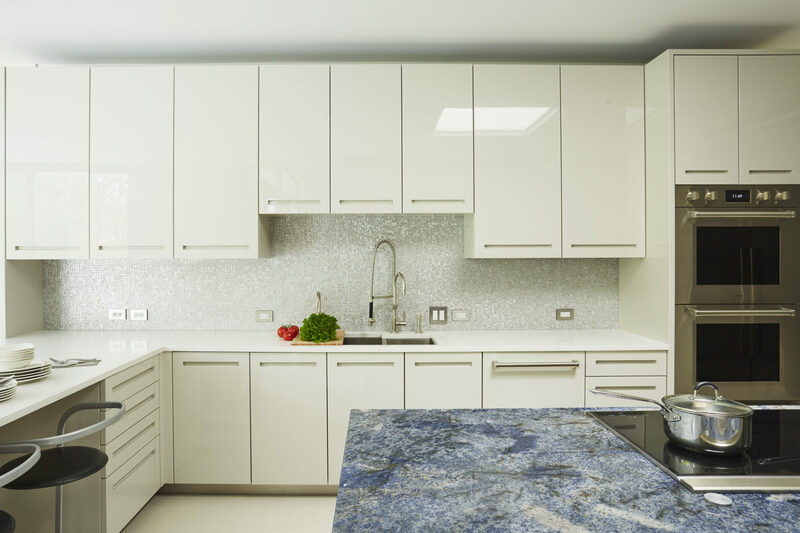 Hylan utilized Silver Frost melamine interiors to complement the Benjamin Moore high buff painted exteriors and Caesarstone ‘Organic White’ perimeter counter tops. 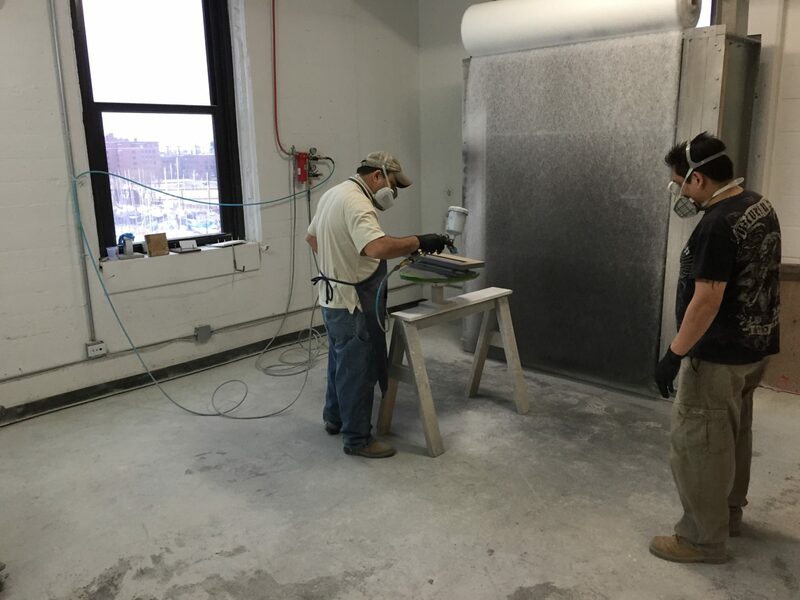 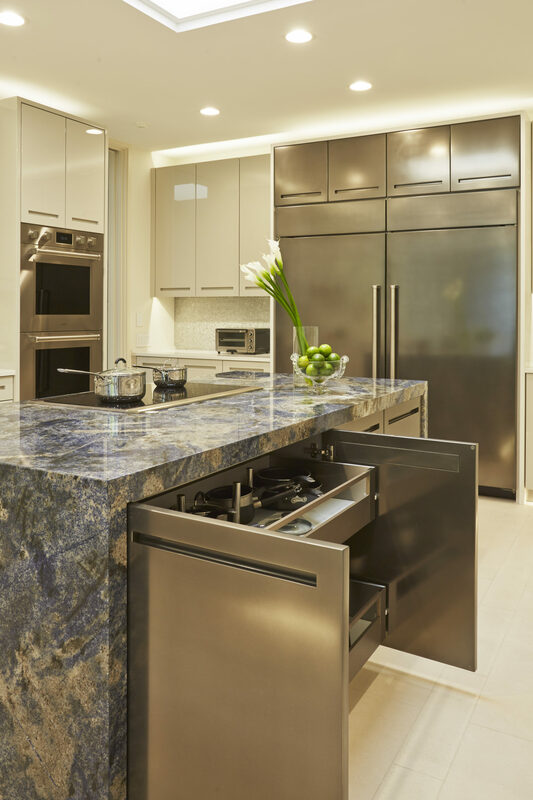 Pulverized White Bronze metal was sprayed and buffed on the island faces and refrigerator/freezer panels to accent the design. 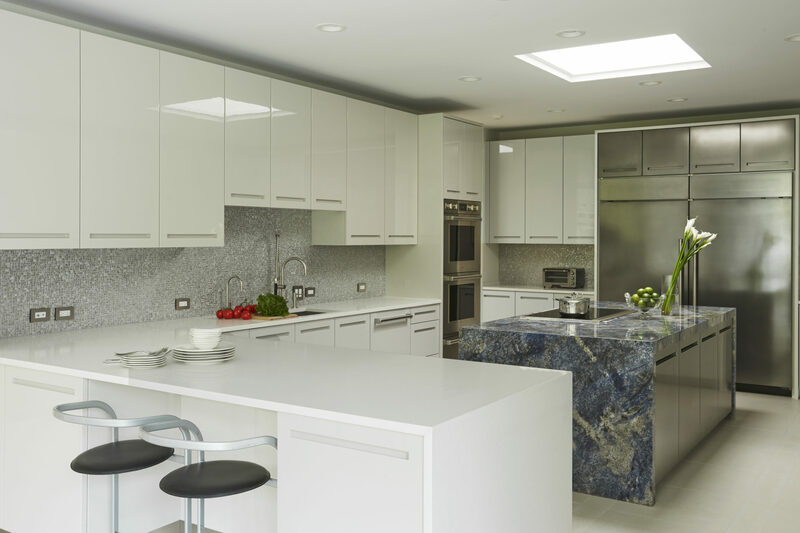 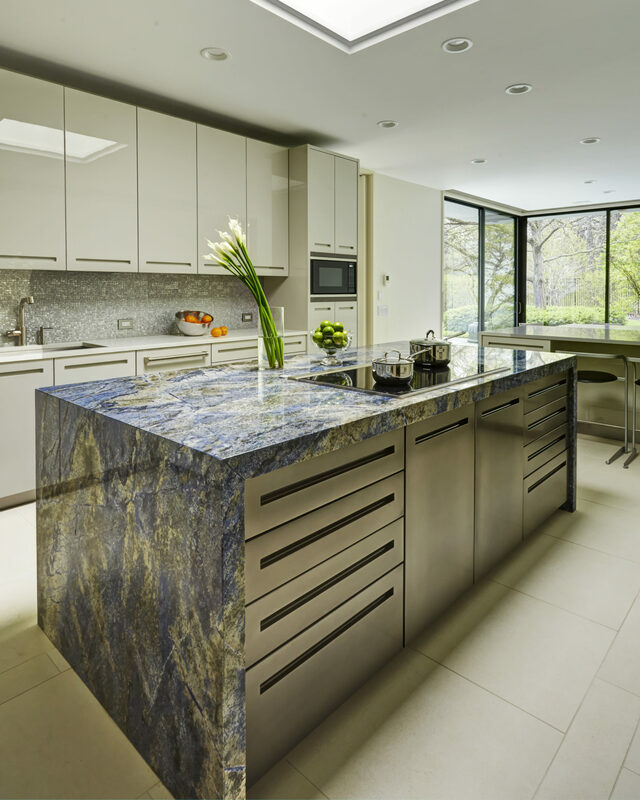 The island grounds the entire space with a stunning blue stone waterfall counter. 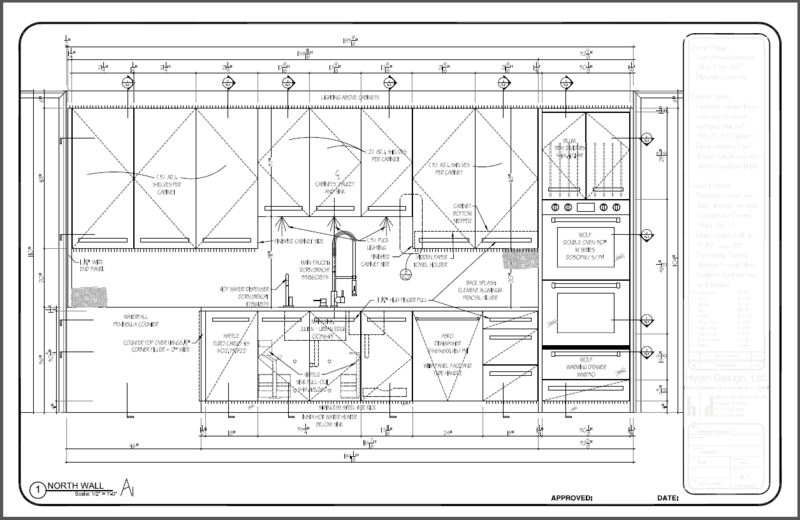 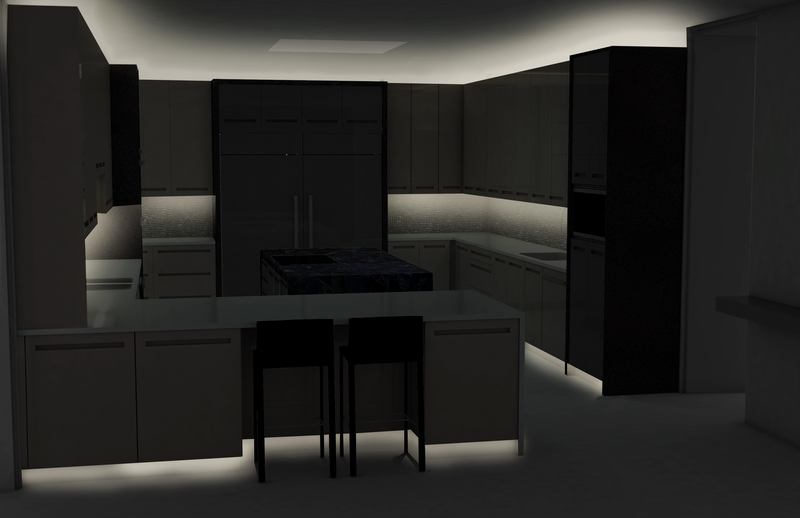 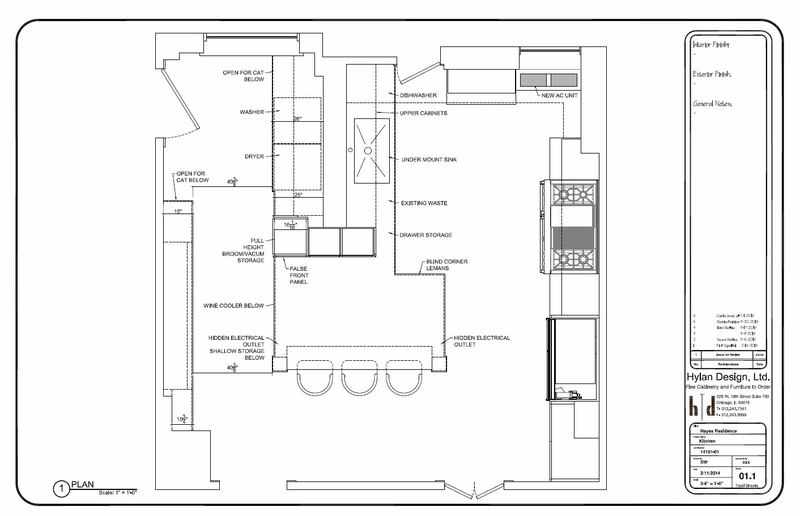 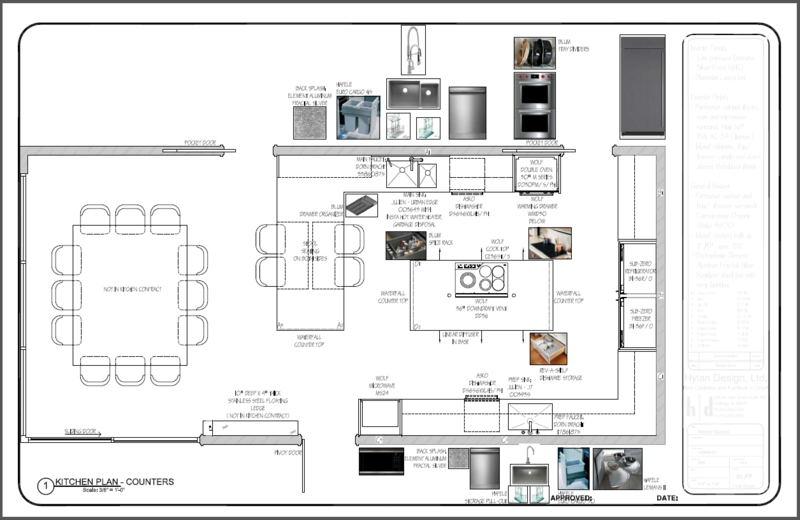 The end result is a remarkably functional and highly stylized kitchen that fits seamlessly with the rest of the house. 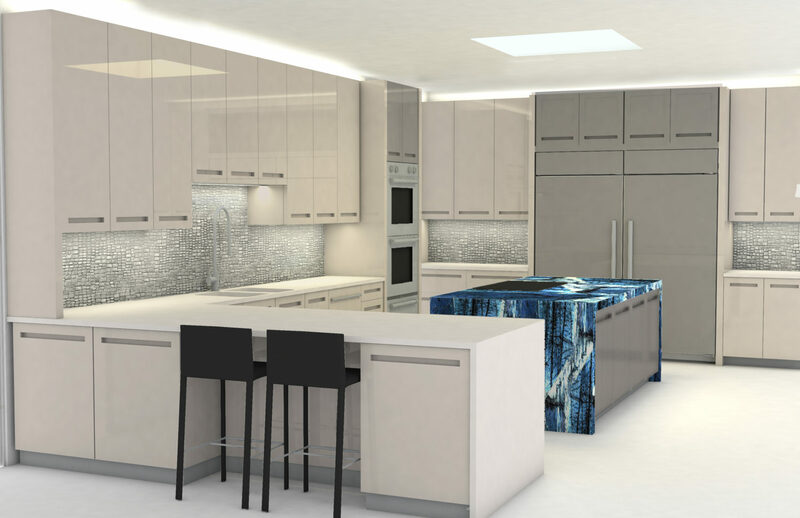 High gloss cabinetry, White Bronze metalized accents and an eye catching waterfall island - perfection! 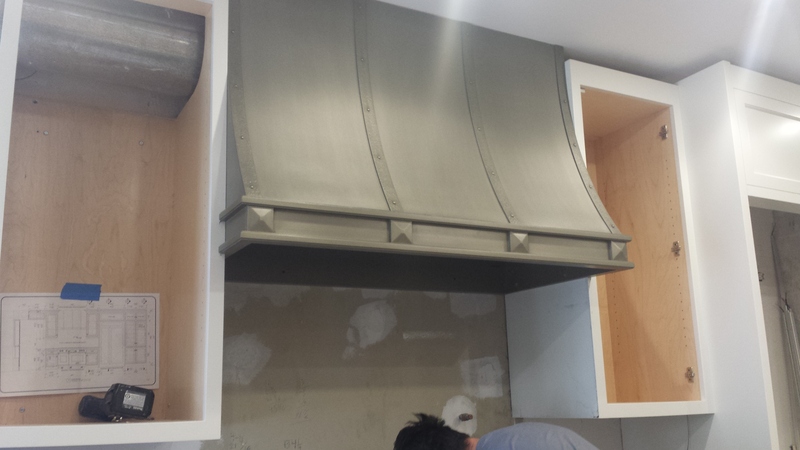 Installation is always exciting and nerve wracking! 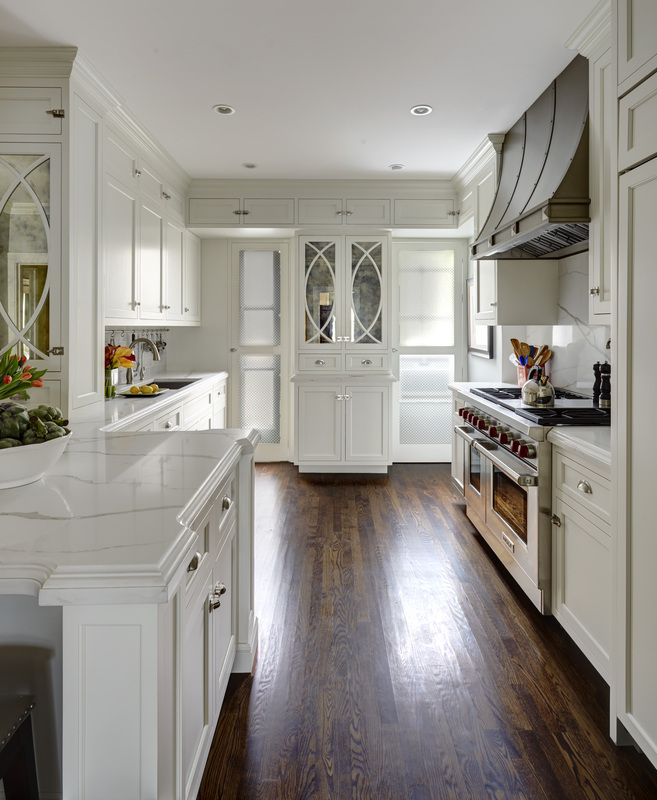 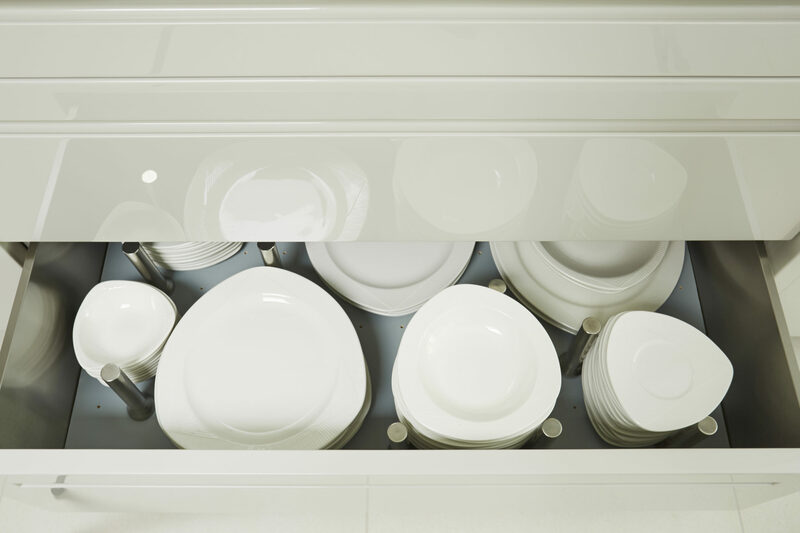 There is accent under cabinet lighting, up lighting above the cabinets as well as lighting in the toe kicks.